end of four years after my Deceas. four years after my deceas. the end of four years after my Deceas. hereunto set my hand & seal the Day & year above written. Henry Harrison Metcalf and Otis Grant Hammond, editors, Probate Records of the Province of New Hampshire (Concord, N.H.: Rumney Press, 1915), Vol. 3, 1741-1749, State Papers Series Vol. 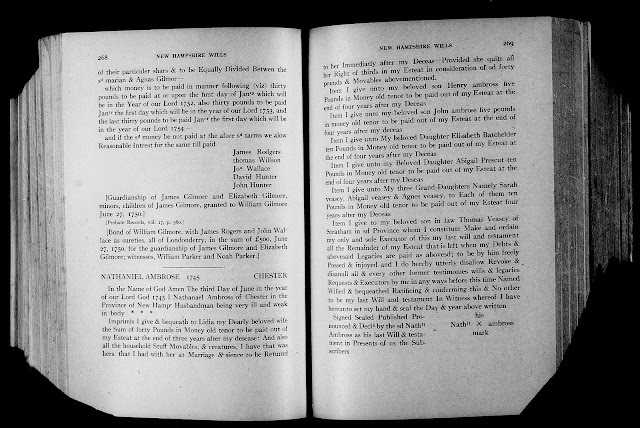 33, pages 268-270, Nathanael Ambrose of Chester probate records, 1745; digital images, Ancestry.com, (http://www.ancestry.com : accessed 30 April 2017; in "New Hampshire Wills and Probate Records, 1643-1982," All Counties > Vol. 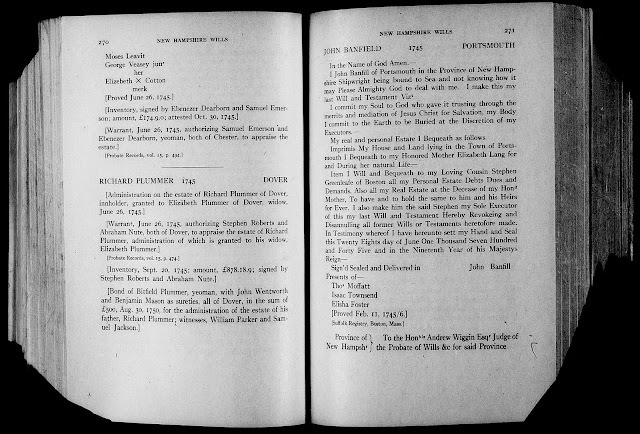 32-34, images 629-630 of 1219; original data from New Hampshire County, District and Probate Courts. This probate record is from the published volumes of New Hampshire Province probate records which were transcribed from the original wills located in the New Hampshire town and county court records. I found it on Ancestry.com in printed form. It is also in book form on library shelves, in digital form on the Internet Archive, and on microfilm at the Family History Library. I don'rt know if the original probate records are still extant or not - I did not see them listed in the FHL Catalog. Nathanael Ambrose died in June 1745, leaving a (third) wife Lydia and four living children (Henry Ambrose, John Ambrose, Elizabeth Batchelder, and Abigail Prescut, and a son-in-law Thomas Veasey, and three Veasey grandchildren. All of the Ambrose children were from Nathanel's first marriage in 1697 to Sarah Eastman (1674-1728). Thomas Veasey was named as executor and received the remainder of the estate after the legacies, debts and expenses were paid out. Elizabeth Ambrose (1698-1782) was the oldest child, and she married (1) Sampson Underhill (1692-1732) in 1718, and had four children; Elizabeth married (2) Benjamin Batchelder (1708-1782) in 1742, and they had no recorded children. Elizabeth Ambrose (1698-1782) is my 7th great-grandmother, through her son John Underhill (1721-1793).